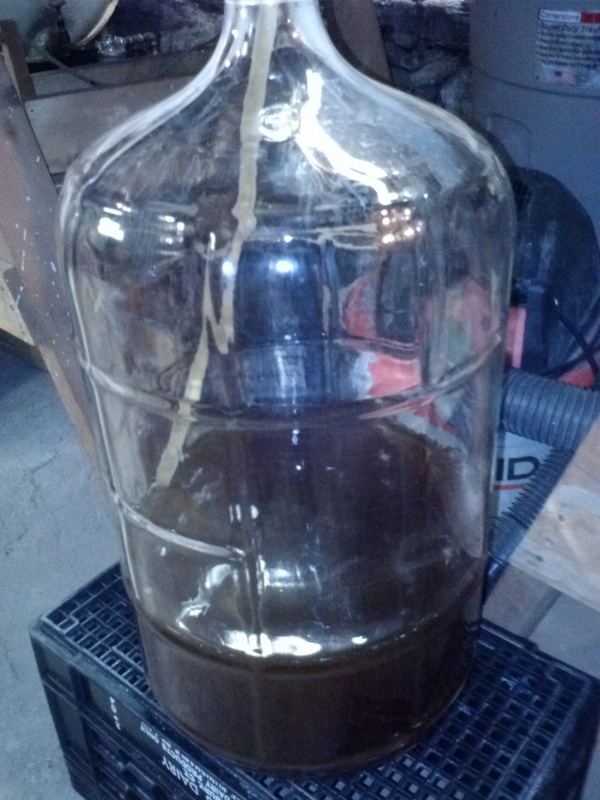 Climbing the industrial steel stairs, we passed through the battered door to the inviting, earthy aroma of fermentation. Rob Schulten welcomed us to the Asylum Distillery, an open space filled with gleaming stainless steel equipment and sacks of corn for making his finely crafted spirits. Well-fed from a hearty lunch at Hub and Spoke in Black Rock, we had driven across Bridgeport to the industrial area on Asylum street facing the Lakeview Cemetery, in search of the only liquor being distilled in Fairfield County. 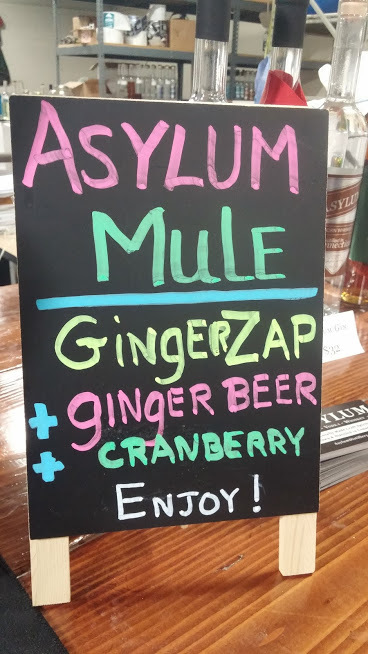 There are six spirits in active production at Asylum: Vodka, Gin, Corn Whisky, Aged Corn Whiskey, Maple Whisky, and Ginger Zap. 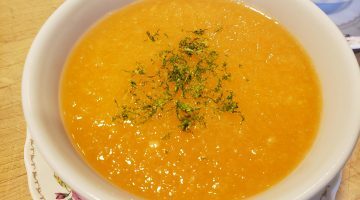 All are based on Connecticut-grown, organic, non-GMO corn from Pleasant View Farms in Somers. Open 18 months for tasting, they’ve been at this location for four years getting licensed, installing equipment, and building inventory. 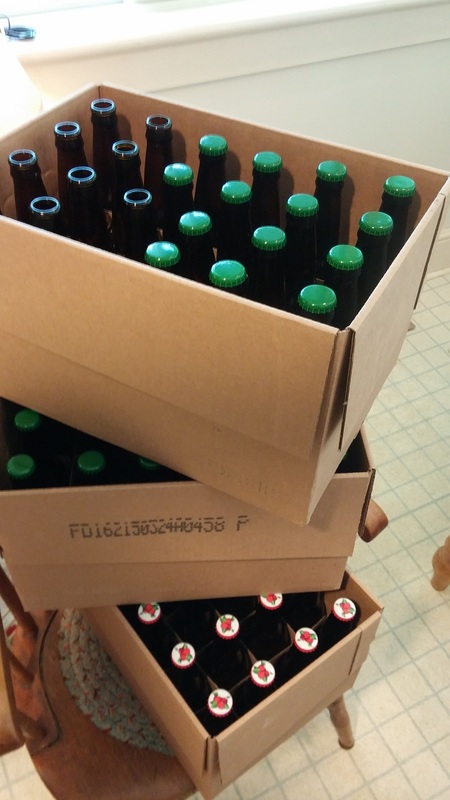 With a background as a chemical engineer and deep roots in the area (Rob’s family owned Old MacDonalds Farm in Norwalk), he’s a natural at this. 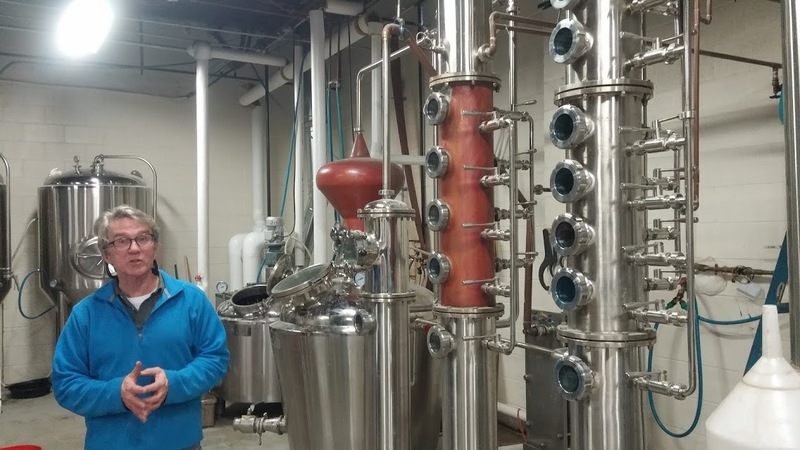 It’s the first craft distillery in Fairfield County since prohibition. 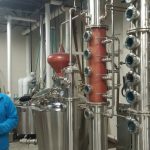 Rob walked us through the distilling process, explaining each step as he showed us the sophisticated equipment: milling the corn, cooking the mash to release sugar from the starch, fermenting the mash to convert sugar to alcohol, and then distilling to raise the alcohol level from 30% to 80%. Rob’s eyes light up as he digs into the details of distilling. His lifetime of experience and technical expertise shows in the finesse of the final product. The crisp, sharp, vodka, a great mixer on its own, is also the base for the juniper-infused gin. 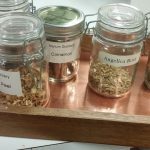 To make gin, the vodka is distilled a second time, passing through the gin basket that’s been loaded with juniper, coriander seed, dried orange peel, angelica root, and cardamom to build classic gin flavors. 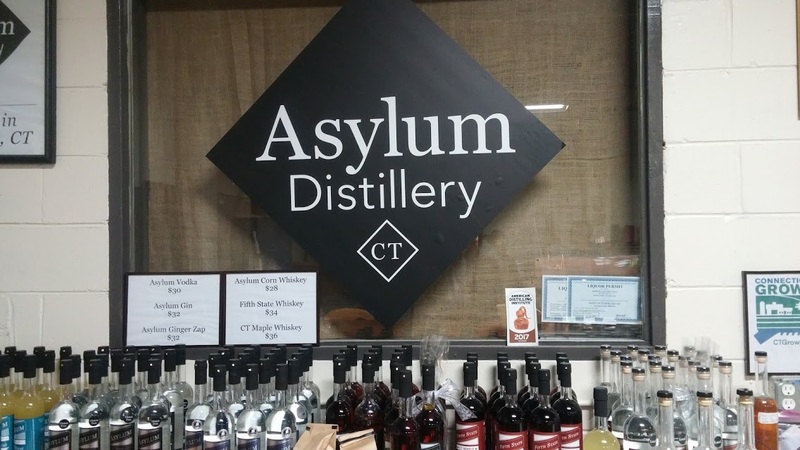 All spirits come off the still crystal clear, like the Asylum Corn Whiskey, an old-time spirit (moonshine) that’s making a comeback these days. 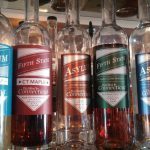 In order to get the caramel color and more complex flavors, Asylum’s Fifth State Aged Corn Whiskey is oak-barrel aged. 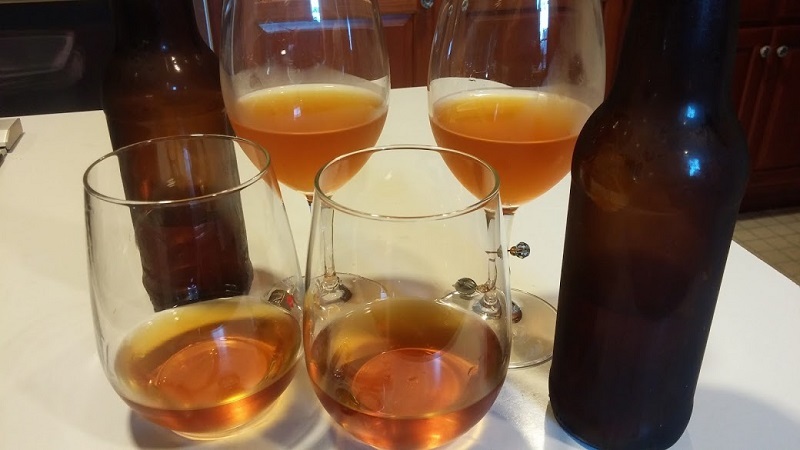 Rob was drawn to distilling in part because of his love of flavors and the chance to experiment with new combination. 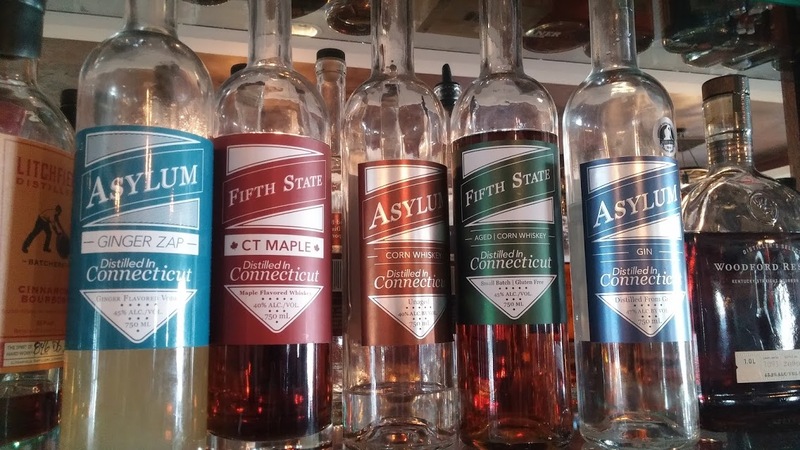 His Fifth State Connecticut Maple Whiskey, for example, is the Aged Corn Whiskey with a touch of Connecticut maple syrup. 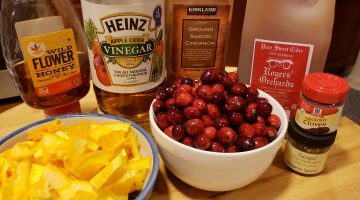 It’s whisper of maple makes a memorable Manhattan. 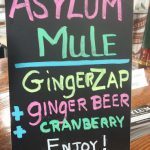 Ginger Zap, another original flavor from Asylum, has plenty of fresh ginger flavor, no sugar, and a brisk almost citrusy edge. 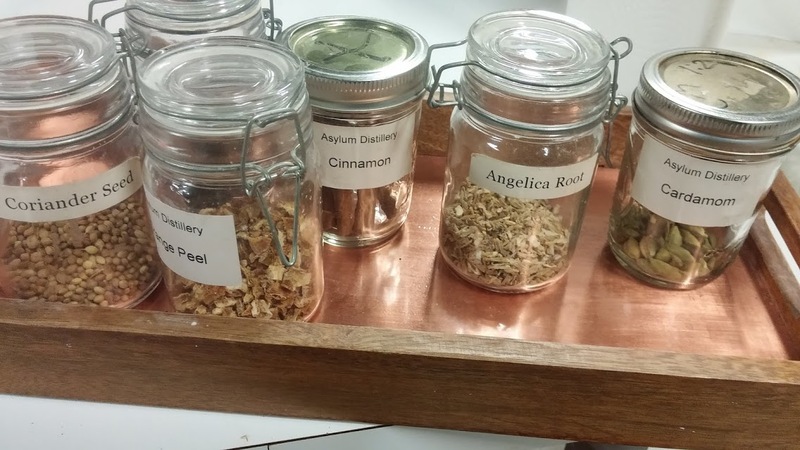 It’s an original cocktail ingredient. The distillery is open for tasting on Saturday’s (reservations required). 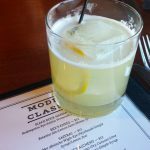 Visit the Asylum website for restaurants and retailers that carry their spirits. 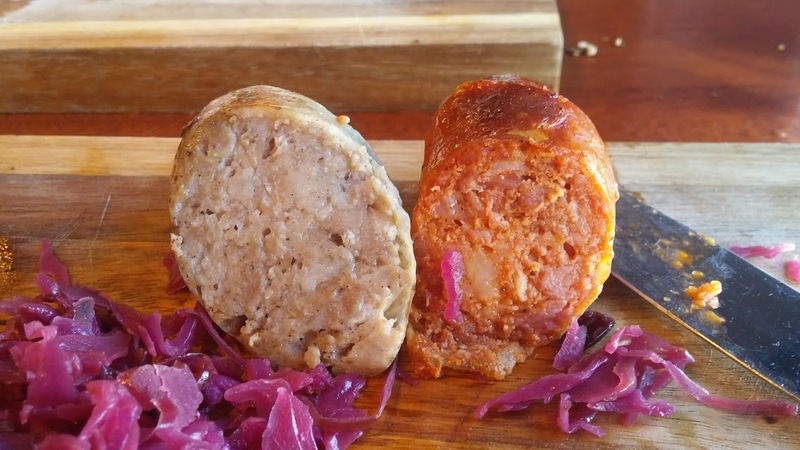 We prepped for tasting with a hearty lunch at Hub and Spoke in Black Rock. American Tapas is their tagline, and there’s plenty of tempting small plates on the menu, but the real surprise was in the Cutting Boards category. 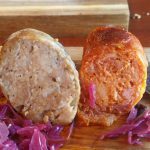 Kielbasa, Italian, andouille, bratwurst, and chorizo – all their sausages are made right there and finished in their own smoker. “They smoke with either oak or cherry wood,” our waiter told us enthusiastically. 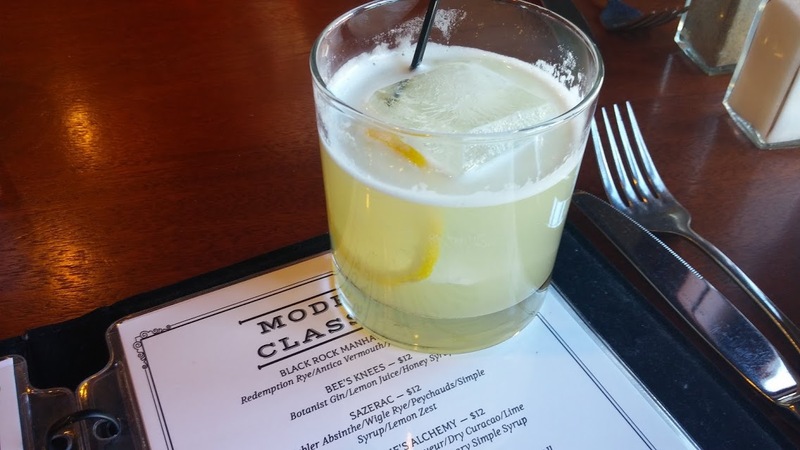 A Bee’s Knees cocktail (gin, lemon, and honey) made with Asylum gin gave us a head start on the afternoon’s tasting. Garlicky broccoli rabe with the house-made Italian sausage and shaved Parmesan along with a platter of deviled eggs got things underway. 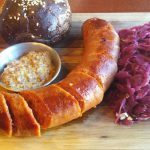 Marsha picked the bratwurst with house-fermented kraut while I ordered smoked kielbasa with red cabbage. 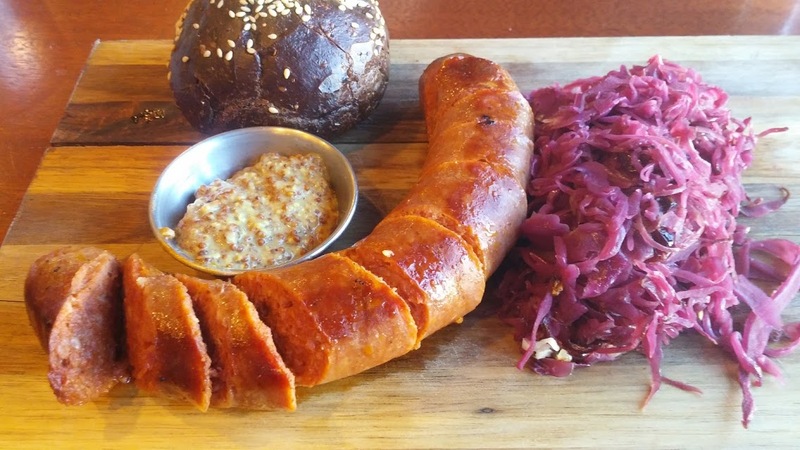 Both had a course house-made texture – the brat, porky and peppery, the kielbasa rosey with paprika. The presentation was gorgeous and the portions were generous, but so tasty we ate it all! 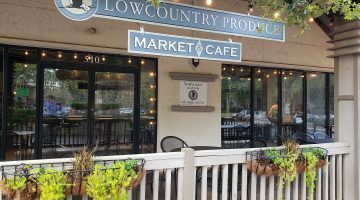 The long hard-to-choose-from menu covered burgers and sandwiches (16 choices), salads, and about two dozen creative American tapas. Desserts included a too-tempting banana cream pie in a chocolate cookie crust, which did not disappoint. The long back bar was stacked with specialty liquors and had at least a dozen craft beer taps. There’s lots to explore here – cocktails, beer, and sipping spirits – for future visits. 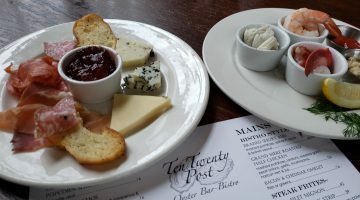 An outstanding lunch followed by a memorable tour and tasting – an afternoon well spent.